Five years after the Russia's incursion into the sovereign territory of Georgia and its large-scale military aggression against the independent state on 7 August 2008, the Russian armed forces still continue the occupation of 20 percent of Georgia's territory in flagrant violation of the fundamental principles of international law, and deprive hundreds of thousands of victims of several waves of ethnic cleansing, including that of 2008, of their internationally recognized right to safe, dignified and voluntary return. This has been concurred by Russia's persistent efforts to obtain the recognition of Georgia's occupied regions under its effective control and heavy military presence, including through active application of political, military and economic leverages. Thus far, the Russian Federation continues to flout its obligations under the six-point Ceasefire Agreement, brokered by the EU and signed by Georgia and Russia on 12 August 2008. Instead of withdrawing its forces to their pre-war positions, as set out in the Ceasefire Agreement, the Russian Federation has exponentially reinforced its military bases, illegally deployed in Georgia's occupied regions, through installing heavy offensive equipment and increasing the number of military personnel. Contrary to the provisions of the 12 August 2008 Ceasefire Agreement, the Russian Federation openly opposes the establishment of international security and stability mechanisms in the territories under its effective control and continues to halt humanitarian access therein. Despite Russia's aggression in August 2008 and its persisting destructive policy directed against Georgia's independence and statehood, the Government of Georgia seeks a gradual normalization of relations with the Russian Federation, based on the principle of sovereignty and territorial integrity of Georgia within its internationally recognized borders. In an effort to create conditions conducive to the de-escalation of tensions with Moscow, Georgia has undertaken a number of concrete, substantial initiatives: - Tbilisi undertook an unilateral legally binding pledge not to use force to solve the conflict, - removed barriers for Russia's membership in WTO, - unilaterally abolished the visa requirements for citizens of the Russian Federation, - refused to boycott the Sochi Olympic Games 2014, - stated readiness for cooperation to ensure security of the Sochi Olympics, - nominated a Special Representative on the Relations with the Russian Federation, reaffirming the political will and readiness to resume trade, economic, humanitarian and cultural relations with Russia. Notwithstanding the certain degree of positive dynamic in the spheres of economic and humanitarian cooperation, unfortunately, Moscow has further intensified its provocative policies aimed at destabilizing Georgia. The Russian side reactivated the process of installation of barb-wire fences and embankments across the occupation line in the Tskhinvali and Abkhazia regions that are in full breach of public international law and represent human rights violations. The expansion of the area of occupation through installing fences and installations into the territory of Georgia clearly violate Georgia's sovereignty, territorial integrity and the inviolability of internationally recognized borders and are in flagrant violation of the 12 August Ceasefire Agreement. Moreover, Russia, as an occupying power, exercising effective control over the Abkhazia and Tskhinvali regions of Georgia, bears responsibility under international law to respect the fundamental rights and freedoms of the population residing on the occupied territories. On the fifth anniversary of the Russia-Georgia August 2008 war, the Government of Georgia reiterates that its goal is to resolve the existing conflict with Russia in a peaceful manner through negotiations based on the principles of international law. Georgia maintains a constructive position in the framework of the Geneva Discussions. Unfortunately, Russia has intensified its strategy aimed at undermining the Geneva International Discussions that further threatens the implementation of the 12 August 2008 Ceasefire Agreement. Georgia highly values the Geneva International Discussions and through its active cooperation with the co-Chairs - the EU, the UN and the OSCE, is committed to advance a substantial work on the realization of the two main aims of the discussions - developing international security arrangements and ensuring the safe and dignified return of displaced persons. Georgia strives to restore confidence and trust between the people divided by the war, re-engage them in common endeavors and restore day-to-day relations. By extending the hand of reconciliation to Abkhaz and Ossetian compatriots, the goal is to offer them opportunities for economic and social development and enable the communities divided by the occupation line to set aside past disagreements and build the shared future. Georgia is grateful to its partners, who did not leave the country alone either during the August 2008 war, or afterwards, in the face of the existential challenge to its security and stability. Georgia values the diplomatic efforts of the allies, who helped stop and deter further aggression of the Russian troops and provided considerable assistance to the Georgian Government in restoring economic stability and repairing damaged infrastructure. Georgia is particularly grateful to the EU and its Member-States that contribute personnel to the European Union Monitoring Mission - the only viable international mechanism currently operating on the territory of Georgia and an essential guarantor of its security and stability. The Government of Georgia believes that building the independent and democratic state is the most effective and certain way to achieve prosperous future for the reunited Georgia. In implementing this vision, we need close partnerships with the countries of the region, with members of the Euro-Atlantic family and with international organizations. 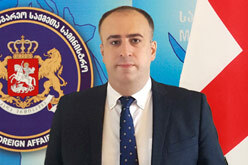 From its side, Georgia remains committed to assume an active role in the strengthening of international security in the region and the out world. Despite the existing serious challenges, Georgia firmly stands on its course towards the European and Euro-Atlantic integration and spares no efforts to realize the aspiration of the Georgian people. The recent evolution of the EU-Georgia relations enables Georgia to look confidently towards the future. Further integration into the European family not only will help the successful accomplishment of Georgia's national project, but establish the country firmly among the free and democratic nations of the world.